The Fourth Judicial District Commission on Judicial Performance in a 7-3 vote, recommends that Judge Daniel S. Wilson BE RETAINED. 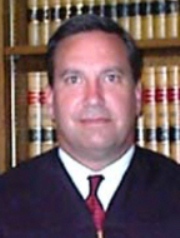 Judge Wilson has served on the County Court bench since 2002. Prior to his appointment, he worked in private practice for four years and in the DA's office for almost eight years. Judge Wilson graduated from the law school at the University of Nebraska, Lincoln, in 1989 and from the University of Colorado, Colorado Springs, in 1982. Judge Wilson has served on Teen Court, and otherwise engages in various community activities with his family. The Commission conducted a personal interview with Judge Wilson, reviewed his self-evaluation and written opinions, observed him in the courtroom and reviewed survey results from attorneys and non-attorneys. 72% of the attorneys who completed the survey recommended that Judge Wilson be retained. 76% of non-attorneys who completed the survey recommended Judge Wilson be retained. Attorneys rated Judge Wilson somewhat lower than the average for other County Court Judges standing for retention on case management and average or slightly lower than average on application and knowledge of the law, communications and diligence. Non-attorneys also rated Judge Wilson slightly below the average for other County Court Judges standing for retention in the areas assessed.